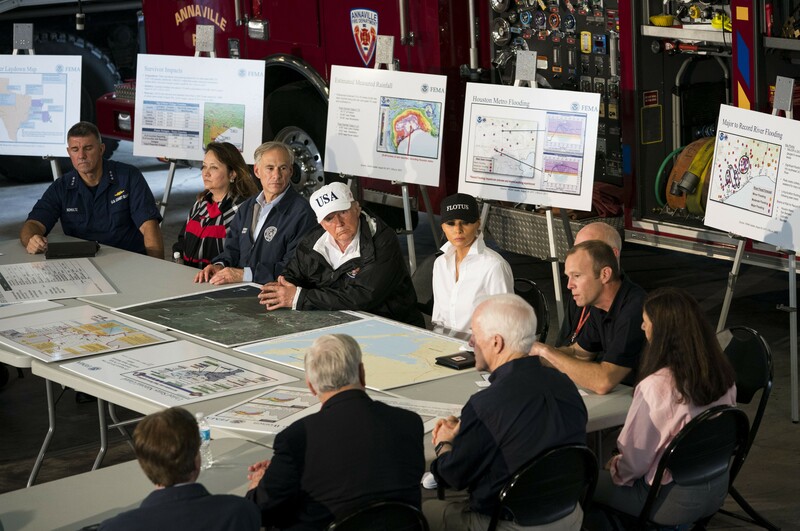 President Donald Trump participates in a briefing on relief efforts following Hurricane Harvey, at a fire station in Corpus Christi, Texas, Aug. 29, 2017. After conferring with local, state and federal emergency management officials here, Trump plans to travel to Austin, the state capital. Seated next to Trump are Gov. Greg Abbott of Texas and first lady Melania Trump. WASHINGTON — President Donald Trump landed in storm-brushed Corpus Christi, Texas, on Tuesday to see for himself some of the damage caused by Tropical Storm Harvey and demonstrate his personal commitment to a region still in the grips of a historic natural disaster. Trump, who pushed aides to schedule a visit to Texas as early as possible after Harvey made landfall near Rockport, Texas, on Friday night as a Category 4 hurricane, initially considered touring San Antonio, which is outside the most hard-hit areas. But he settled on Corpus Christi because it was 30 miles away from the most severely affected parts of the Gulf Coast and it sustained relatively light damage from the initial impact of the storm. Gov. Greg Abbott of Texas, sitting next to the president, sought to allay concerns about the situation at the convention center in downtown Houston, where 9,000 residents fleeing rising floodwaters have crammed into a makeshift shelter designed to accommodate 5,000. “This is not the Superdome,” Brock Long, the director of the Federal Emergency Management Agency, said, referring to the nightmarish conditions residents of New Orleans endured while seeking shelter at a sports arena after Hurricane Katrina 12 years ago. “At the convention center, we are sustaining food,” added Long, who sat near the state’s junior senator, Ted Cruz, who was briefly trapped by flooding in Houston on Monday. The people at the convention center have food and security, Long said. “All eyes are on Houston, and so are mine,” added Long. After conferring with emergency management officials, the president, accompanied by Melania Trump, the first lady, boarded Air Force One to travel north to Austin, to meet with other officials. 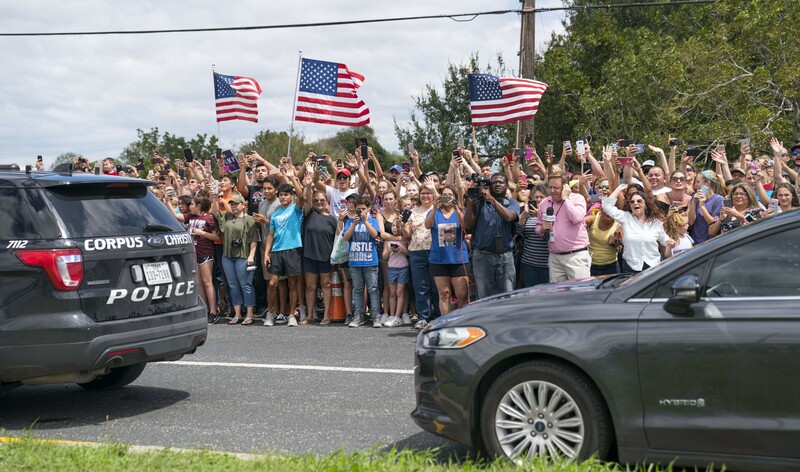 Supporters outside a fire station where President Donald Trump participated in a briefing on relief efforts following Hurricane Harvey, in Corpus Christi, Texas, Aug. 29, 2017. After conferring with local, state and federal emergency management officials here, Trump plans to travel to Austin, the state capital.